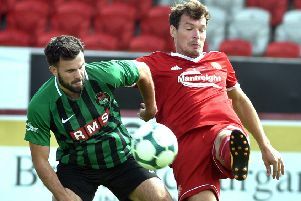 Substitute Harry Anderson climbed off the bench and on to the scoresheet as County Armagh opened the SuperCupNI week with a 1-1 draw against Rangers. It marked the second successive meeting between the Scottish giants and Orchard County boys for the first match of the tournament, with Rangers having secured victory last year thanks to a last-gasp goal in a 2-1 win. Anderson grabbed the crucial goal on Monday night at Coleraine Showgrounds with a finish off Shane Adamson’s delivery. Rangers had moved in front, with a superb save by David Walsh restricting the deficit to a single goal. County Armagh Junior squad manager Chris Chambers is keen to now use the momentum for future progress. “Last year you could see the confidence and encouragement the boys managed to get from such a big performance against Rangers, despite the result,” said Chambers, who is in his first year as Junior manager after serving on the coaching staff in the past. “To get a draw this time around is one better and we really went for it the first 10 minutes as adrenaline probably kicked in. “We conceded due to poor communication but regrouped at half-time and the substitution worked well. “It was an open game overall and both sides created chances with a draw, I feel, a fair result. COUNTY ARMAGH: David Walsh (Linfield), Jesse Carson (Linfield), Caolan Connell (Windmill Stars), Shea Conway (TTBS), Shane Adamson (Glenavon), Adam Wright (Dungannon), Chris Hutchinson (Portadown), Jack Scott (Linfield), Harry Evans (Glenavon), Alberto Balde (Portadown), John McGovern (Windmill Stars). Subs (used): Harry Anderson (Portadown), Dane McCullough (Portadown).